“We went all over the world and we did what we wanted,” said Al Ulmer, the C.I.A.’s Far East division chief in the 1950s. “God, we had fun.” But even their successes turned out to be failures. In 1963, the C.I.A. backed a coup to install the Baath Party in Iraq. “We came to power on a C.I.A. train,” said Ali Saleh Saadi, the Baath Party interior minister. One of the train’s passengers, Weiner notes, was a young assassin named Saddam Hussein. The C.I.A. never did have much luck operating inside Communist China, and it failed to predict the Iranian revolution of 1979. “We were just plain asleep,” said the former C.I.A. director Adm. Stansfield Turner. The agency also did not foresee the explosion of an atom bomb by the Soviet Union in 1949, the invasion of South Korea in 1950, the popular uprisings in Eastern Europe in the 1950s, the installation of Soviet missiles in Cuba in 1962, the Arab-Israeli war of 1973, the Soviet invasion of Afghanistan in 1979, the collapse of the Soviet Union in 1989, Iraq’s invasion of Kuwait in 1990, the explosion of an atom bomb by India in 1998 — the list goes on and on, culminating in the agency’s wrong call on Iraq’s weapons of mass destruction in 2002-3. When presidents finally faced the reality that the agency was bumbling, they could be bitter. Reviewing the C.I.A.’s record after his two terms in office, Dwight Eisenhower told the director, Allen Dulles, “I have suffered an eight-year defeat on this.” He would “leave a legacy of ashes” for his successor. A fan of Ian Fleming’s spy stories, John F. Kennedy was shocked to be introduced to the man described by C.I.A. higher-ups as their James Bond — the fat, alcoholic, unstable William Harvey, who ran a botched attempt to eliminate Fidel Castro by hiring the Mafia. Ronald Reagan went along with the desire of his C.I.A. director, William Casey, to bring back the mythical glory days by “unleashing” the agency — and his presidency was badly undermined by the Iran-contra affair. In Weiner’s telling, a president trying to use the C.I.A. resembles Charlie Brown trying to kick the football. The role of Lucy is played by scheming or inept directors. Dulles is particularly egregious, a lazy, vain con artist who watches baseball games on television while half-listening to top-secret briefings (he assesses written briefings by their weight). Casey mumbles and lies and may have been almost mad from a brain tumor by the end. Even the more honorable directors, like Richard Helms, can’t resist telling presidents what they want to hear. To fit the policy needs of the Nixon White House in 1969, Helms doctored a C.I.A. estimate of Soviet nuclear forces. In a draft of the report, analysts had doubted the Soviet will or capacity to launch a nuclear strike. Helms erased this crucial passage — and for years thereafter, until the end of the cold war, the C.I.A. overstated the rate at which the Soviets were modernizing their arsenal. The C.I.A.’s bogus intelligence on Iraq in 2002-3, based on the deceits of dubious sources like the one known as Curveball, was hardly unprecedented. To justify the Johnson administration’s desire for a pro-war Congressional resolution on Vietnam in 1964, the intelligence community manufactured evidence of a Communist attack on American destroyers in the Gulf of Tonkin. Weiner is not the first reporter to see that the C.I.A.’s golden era was an illusion. After the 1975 Church Committee hearings exposed the agency as “the gang that couldn’t shoot straight,” various authors began to deconstruct the myth of the C.I.A., most notably Thomas Powers in “The Man Who Kept the Secrets.” But by using tens of thousands of declassified documents and on-the-record recollections of dozens of chagrined spymasters, Weiner paints what may be the most disturbing picture yet of C.I.A. ineptitude. After following along Weiner’s march of folly, readers may wonder: Is an open democracy capable of building and sustaining an effective secret intelligence service? Maybe not. But with Islamic terrorists vowing to set off a nuclear device in an American city, there isn’t much choice but to keep on trying. 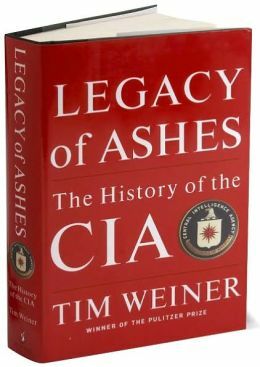 A review on July 22 about “Legacy of Ashes: The History of the CIA,” by Tim Weiner, referred incorrectly to Defense Secretary Robert M. Gates. When Iraq invaded Kuwait in August 1990, Gates was George H. W. Bush’s deputy national security adviser, not his “top intelligence adviser”; he did not became the director of central intelligence until November 1991.